Traveling with a mobility aid such as a wheelchair can be stressful, but using an assistive device shouldn't stop anyone from having a relaxing, smooth trip, whether it be for business or pleasure. 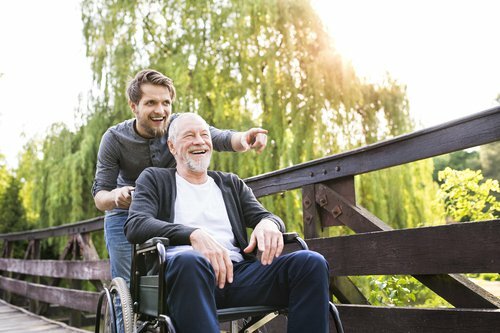 Here at Cheapism, we've compiled the best tips and tricks for stress-free travel with a wheelchair or other mobility aid for both domestic and international travel. Making air travel easier starts the moment you book your flight. First of all, don't choose a seat in an exit row, as travelers seated in the exit row may be required to help flight attendants without the use of any assistive devices in the event of an emergency. But if you are assigned a seat in an exit row when you get to the airport or the gate, don't panic -- the airline will simply move your seat assignment or, if you're already on the plane, will ask for a volunteer to switch seats with you. When you buy your ticket online, you should register yourself as a person who uses a wheelchair or mobility aid. Every airline website will offer this option, usually on the page where you add your passenger information. On most airline sites, a tiny box will pop up and ask if you have any mobility needs, and if you click yes, a larger box will pop up where you add the details. If you can't find a place to add this information, don't hesitate to call the airline and ask. If you prefer to book your flight on a discount site, you probably won't see this registration option, but that doesn't mean you can't save a few bucks. Simply book your ticket on the discount website and, after receiving your reservation information via email, go to the airline's website and register yourself there. If you will be using an assistive device provided by the airline upon arrival at the airport, registering your mobility needs ahead of time will make airport transit quicker and easier, because the airline will already have a wheelchair or other device reserved for you and a gate agent ready to assist you. If you don't let them know in advance, all the chairs may already be in use or the staff occupied, and you may have to wait until a chair and gate agent become available. That being said, registering yourself as a passenger using an assistive device does not only apply to passengers who will be using an airport-provided mobility aid. It is just as essential to register ahead of time if you plan to bring your own chair or other device and check it at the gate. For wheelchairs, it requires at least two staff members to bring it down below the plane to be stored with other baggage. More importantly, there is a limited amount of space in the cargo area, and many mobility aids like wheelchairs and scooters are often bulky, heavy, and larger than a checked bag, meaning that each plane can only fit so many. Registering your device is especially important during holidays and busy travel seasons when there may be more people traveling with assisted devices. At Christmas time, for example, there may be 10 wheelchairs on one flight, and you don't want to have to choose between taking a later flight with your chair or taking your scheduled flight without it. For individuals using motorized devices such as scooters, be sure to check with the airline to make sure you can safely travel with that device. Certain lithium batteries, which are often used in scooters, are no longer allowed in the cargo areas because they have been known to combust. You may be able to remove the battery and take it in the cabin, depending on both the scooter model and the airline. Every airline has different rules on lithium batteries, so be sure to research and ideally speak with an airline employee ahead of time. When your departure day arrives, the most important thing to do to guarantee a stress-free flight is to arrive at the airport on time or early. Users of mobility aids should arrive by the airline's recommended time, usually two hours ahead of departure for domestic flights and three hours ahead for international flights. During the holidays and on other busy travel days, you'll want to get there even earlier. Even though you might not have to wait in the seemingly endless security lines, air travel with an assistive device will require more coordination with the airline itself. And as we all know, airlines are not typically considered the most efficient businesses. If an airport employee will be assisting you to your gate, it is a good idea to tip them, especially in larger airports where they may be with you for a few hours. While certainly not required, tipping gate agents between $5 and $20 is common and will almost definitely guarantee you a more pleasant experience, especially if you tip up front. When you go through security, the officials will ask if you are able to walk through the metal detector using a wooden cane that they can provide, while they search your chair. If you can't, that's perfectly fine; they'll just pull you aside and physically search you and your assistive device. If you need to take any liquids or electronics out of your carry-on, the gate agent can do it for you. Once you are at the gate and boarding begins, airlines typically seat passengers with mobility devices first, double-checking that you are not ticketed for an exit row seat. On the one hand, this can make it much easier to board, since the plane is empty. However, if you're in a middle or aisle seat, you may need to stand up to let other passengers by, so if you want to avoid that, you might ask to board a little later. Regardless of when you board the plane, if you are using a cane or walker, be sure to keep it with you until everyone else is seated and settled in, then ask the flight attendant to put it up for you. If you let them put it in the cabin immediately, it may be obstructed by other passengers' carry-ons and will be very difficult to reach if you need to use it during the flight. If you have them wait until the last minute, your cane or walker will be right in front and easier to access. If you need to use the restroom at any point, you may ask a flight attendant to retrieve your device, and you may use the closest bathroom to you, even if it's in first class and you are in coach. Before the flight leaves, check with a flight attendant to make sure that you are on the flight manifest, a document given to all flight attendants that lets them know if any passengers require special needs, such as unaccompanied minors, people with severe food allergies, and assistive device users. Once you are on the flight manifest, the flight attendants will let the receiving gate at the destination airport know if you will need a mobility aid or assistance from a gate agent. Again, you don't want to be stuck waiting for a wheelchair or staff member to be available for you. On busy days, it can take up to two hours of waiting. This is especially important if you have a connecting flight, in which case it's advisable to let your flight attendant know you will need to make that connection so that there will be a gate agent and a mobility aid ready for you at the arrival gate. If there is no gate agent available at the receiving airport, make sure a flight attendant waits with you until one arrives. Flight attendants are responsible for your mobility needs until a gate agent arrives, and they will usually stay with you without being asked. But if you have a late-night flight and there aren't a lot of airport staff left, don't let the flight attendants leave with a promise that someone will come to assist you, just in case their request for a gate agent gets lost along the way. Rental car companies are typically very used to accommodating diverse mobility needs, providing assistance on and off buses and trains to and from the airport. However, be sure to reserve a car with an adaptive device or let them know you will need an adaptive device in advance on the company website or over the phone, because there are a limited number of them. If you don't absolutely need a full-size car or larger, you may be able to save a little money by reserving a compact car and registering separately for an adaptive device. Most adaptive devices are made for bigger cars, so you may get a free upgrade to a full-size car, since the company must honor your registration for an adaptive device. Of course, don't forget your parking permit! While it might not be accepted in every country abroad, most differential mobility permits looks very similar across the world, so it's likely that it will come in handy. As for hotels, the same advice for flights and car rentals applies: They will almost always be able to accommodate your needs, but you need to request accommodation in advance. Most large hotel chains abide by the Architectural Barriers Act (ABA) Accessibility Standards and will have rooms accommodating assistive devices, diverse mobility needs, and even hearing impairments, but they will have a limited number of them. In contrast to airline websites, hotel websites do not usually have an accessibility option on the reservation page, nor do discount sites, so the best course of action is to make your reservation by phone. Unfortunately, many bed-and-breakfasts, other smaller hotels, and Airbnbs will likely not be accessible, so if you are set on staying at one of those, call in advance to go over the level of accessibility in detail. No matter where you stay, hotel staff will always be able to help you get your luggage to and from your room. Even if you're at a smaller hotel that doesn't have baggage clerks, the front desk staff will be happy to assist you. Traveling abroad with a wheelchair or other assistive device requires a little more planning than domestic travel, but it's still completely doable. For air travel and car rentals, the same guidelines apply as for domestic travel. For hotels, things can be a bit trickier. Many countries, especially in Europe, have a higher percentage of older buildings that are not as accessible. Every country has different standards as to what is "accessible," so it's a good idea to research the country's rules and regulations in general as well as the specific level of accommodation your hotel can offer. This also applies to restaurants, museums, and any other buildings you may want to visit. You will want to be as specific as possible, because a business's idea of "accessible" might include a short but steep flight of stairs at the doorstep. Or, they might fail to mention that while the main part of the building is accessible, the restrooms are upstairs or downstairs. If you use a power wheelchair or scooter, you will also need to be aware of differing outlets and voltages. Depending on the device model and the country you are visiting, you may need to purchase a voltage converter or a transformer before your trip. John Morris, the self-described accessible-travel guru behind WheelchairTravel.org, recommends asking to speak with the hotel's technician upon booking your room, just in case. Additionally, if you are traveling to a country where another language is spoken, and you won't have a translator, it's a good idea to look up some vocabulary related to your assistive device and mobility needs in case any communication issues arise. Find ways to stay connected cheaply while traveling domestically and abroad.